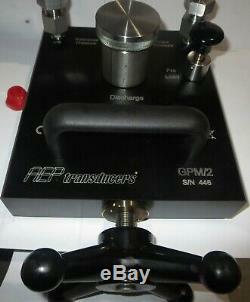 Hydraulic (oil) Pressure Calibration Pump 10 kpsi. 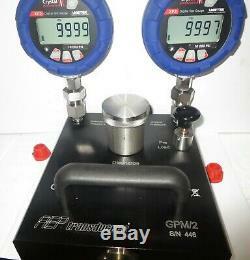 One n ew Ametek Crystal 10 kpsi digital pressure gauge. Screw type Pump with priming pump. Pump has some shelf life, fully tested. Aluminum alloy and stainless steel, weight 6.3 kg. Quick connect ports (no wrenches required). BSP, NPT and CPF ports with. BSP 1/2 G female swivel quick connect. 1/4 NPT female swivel quick connect. 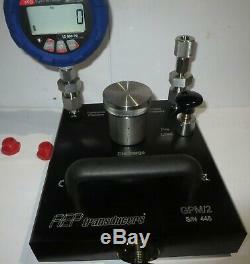 Ametek/Crystal CPF Male for connection of XP2i and M1 gauges. 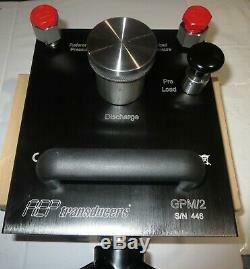 The item "Hydraulic Pressure Calibration Pump 10 kpsi + one XP2i Digital Pressure Gauge" is in sale since Sunday, April 7, 2019. This item is in the category "Business & Industrial\Test, Measurement & Inspection\Testers & Calibrators\Calibrators\Pressure Calibrators". The seller is "borsh13" and is located in US or CAN, North America.